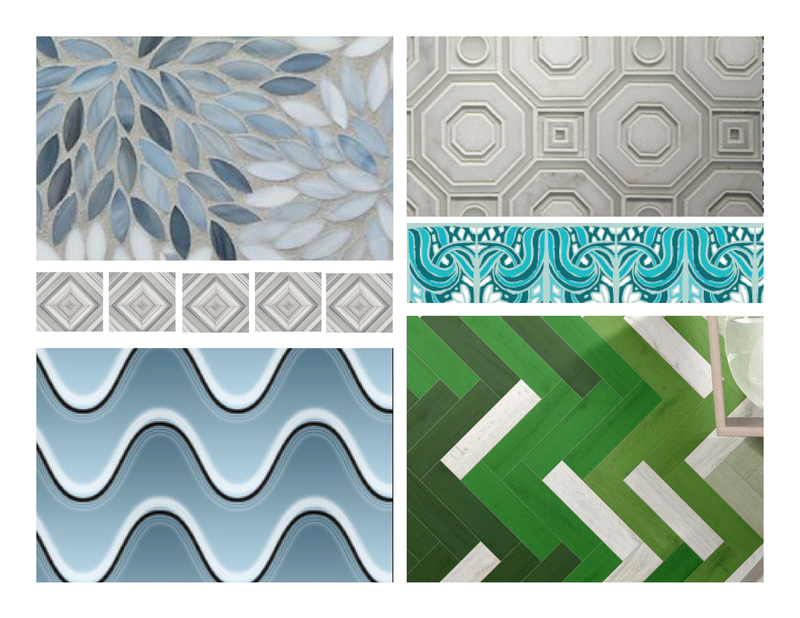 Trend or Tradition: A Tilt Toward Tile in the Home. I’m rarely speechless but I have to tell you … I needed a moment to compose myself. All I can say is STOP IT – no tile should be that beautiful. I’m not creating the Sistine Chapel here. I’m just trying to bring a little pizzazz to my place, but for this tile I’d consider giving up my handbag addiction – just to be in the vicinity of its exquisiteness. If you choose to go this route, there’s no where else to go but breathless. 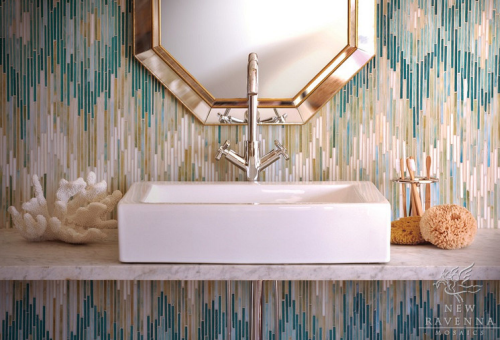 Like wallpaper, tile has evolved from merely a utilitarian covering for the interior of your tub or sub-floor, to a focal point. The addition of complex pattern, the illusion of 3 dimensions, metallics, high relief, and the sensation of movement make these innovations award worthy, and yes, sacrifice. I do really believe I would give up a shoe or two, and that cobalt blue Goyard bag I’ve been eyeing, for this tile. But let’s just say I am slightly on the fence about giving up that bag. The allure of a simple, inexpensive tile in a hip pattern appeals. If you’ve got a little adventure in you, use a colored grout to provide the novelty. People, and me specifically, love when something is inexpensive and clever. I’m always most boastful about the bargains I manage to find or create, and more than a little sheepish about the splurges I make. Subway tile remains a traditional mainstay. Change it up if you like by using a bold color, creating a herringbone or basket weave pattern, stacking it vertically instead of horizontally, using multiple colors to fade from dark to light. Bring your childhood self to play and see what your imagination hatches. Whether you are with means, or saving your pennies, there is often a middle ground which shouldn’t be overlooked. Think big picture. Ben Franklin famously said: “Failing to Plan is Planning to Fail” With a plan in place you will make better decisions about materials, finishes, and furnishings that will become your big impact moments throughout your home, and feel less like you’ve made a series of compromises elsewhere. And there it is – the word compromise. I do it often. With that big picture in mind I reconcile myself to the intent, and am often quite pleased with my inventiveness. 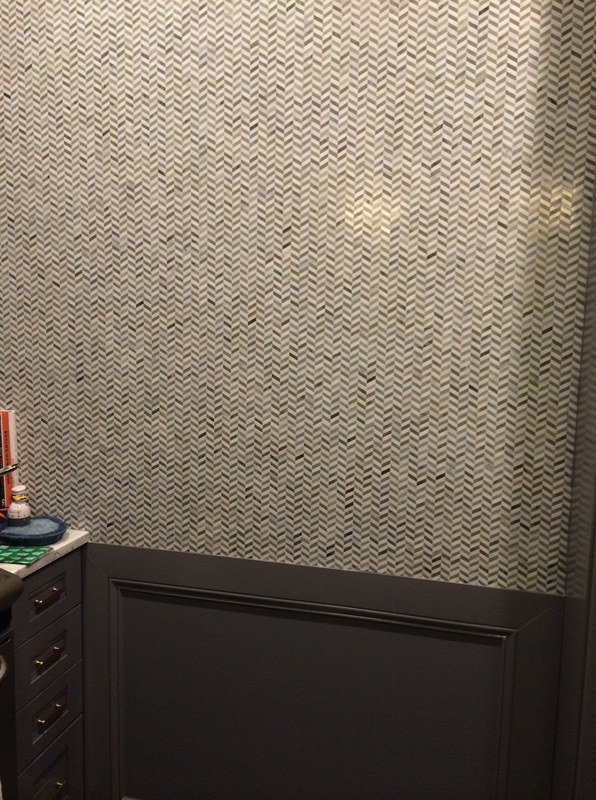 While perhaps not exactly in the same class as the New Ravenna tile pictured above, this herringbone tile in my kitchen was definitely a splurge for me. Instead of tiling the whole wall as originally planned I kept it level with the counter top and made it an accent. It saved $2000. and I am now convinced it was absolutely the right thing to do. I can envision the impression one of these stand out tiles would make in a small vestibule, as an accent in a bath, or narrow hall. If you bare resemblance to me friend, and must preserve those pennies – take heart – like the beautiful man you find from whom you have to avert your gaze, a little is more than enough. Grout with gusto – until next week. « Hitting a Wall? Paper it!